Chamber works - Bohuslav Martinů - Mediální ohlasy - ArcoDiva management - Hudební agentura - Hudební agentura ARCO DIVA Management s.r.o. Bohuslav Martinu was such a prolific composer that even a well upholstered collection of recordings is inevitably going to have many gaps. I hunted high and low for comparisons for some of these pieces on CD, but have come to the conclusion that my Martinu collection isn’t as well filled as I had thought. TheBergerettesare well known, and the trio H300 is one of Martinu’s strongest chamber compositions. Rummaging through my old Supraphon LPs I found most of the repertoire well represented with ensembles including Czech grandees such as flautist Jirí Válek and pianist Josef Hála, and numerous versions are in fact to be found in the current CD catalogues. This new programme is superbly played by the rather coyly named Artemiss Trio, the cover photo of the ensemble looking at a glance like an quadruple portrait of the same person: they’ve clearly been ‘got at’ by the same makeup artist - the cast of something by Agatha Christie. The recording is marvellously detailed and immediate, but even more importantly the programme is one conceived for variety of colour, each piece with its own subtly differing palette and making for a lively and highly effective listening experience. The musicians of the Artemiss Trio are a superbly integrated and musically unified group, but flautist Zofie Vokálová also fits in like a permanent member of the ensemble. Her tone is crisp and pleasant, and doesn’t weigh the notes with too much vibrato. The ArcoDiva engineers have done a superb job on the recording, which is lucid and transparent, while at the same time communicating all of the expressive heft in the fine playing. 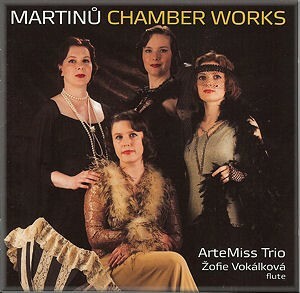 This is a recommended disc for all comers: Martinu newbies and connoisseurs alike, including those who have a few of these pieces already dotted throughout their collections, and especially those who savour the finest in chamber music.